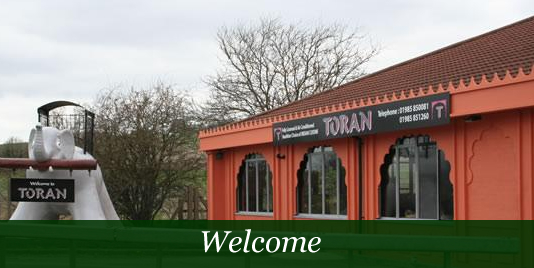 Toran is a new style of Indian restaurant, specialising in healthier options of Indian cuisine. A ‘Toran’ is a gate prepared for special visitors. In India, a Toran is used wherever special visitors are welcomed. It is prepared for the arrival of Royalty, Prime Ministers and at ceremonies such as weddings.We value every guest and offer a warm & friendly welcome through our own Toran. Our large, modern restaurant is located on the outskirts of the historic Wiltshire town of Warminster, near to Longleat, with stunning countryside views. Toran can comfortably seat over 100 guests. We are proud to annouce that we have been awarded GOLD by Wiltshire District Council for EAT OUT EAT WELL. We are the only restaurant in the whole County to have achieved this. We do not use any artificial colourings, flavourings or preservatives in our recipes. All of our dishes are prepared fresh, therefore if you have any dietary requests please inform your server so they may attend to any amendments to your desired dish. Please note that we source as many of our ingredients from local growers and suppliers ensuring the highest quality of standards and freshness. Toran is a unique Indian Restaurant and is capable of catering for small and larger parties, please speak to one of managers to discuss requirements for your next party. Toran is a family friendly restaurant and there is a play area for our younger guests. Please be aware that the play area is NOT supervised and that a parent/guardian should remain responsible at all times when children in your party are using the facility.